If you could spend the next year as someone radically different from the current “you” – a member of a different species, someone from a different gender or generation, etc. who would you choose to be? Many great leaders, sportsmen, actors, singers and scientists have inspired me and I have read their autobiographies and grew up admiring their character, perseverance, integrity and resilience. However, coming to the question of living their life or mimicking them would be totally impossible for me. 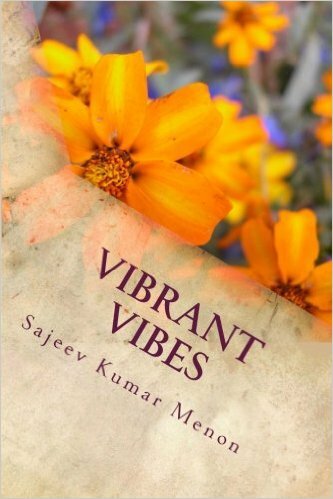 I believe that each of us is unique and we are also shaped by our unique environments, our society, our parents, our teachers and our close friends. So although we may look up to someone as a role model it is wrong to draw comparisons or envy them or dream of coveting their possessions. More than a new skin, a makeover or cosmetic surgery to create a replica of someone else, what is needed is an inner surgery to examine how we could change our character and our attitude. Gandhi said : “Be the change that you want to see in the world”. So I would rather spend the new year being myself but making a purposeful effort to better myself, to take risks, to learn new skills, to be thankful for what I have and to enjoy every day. 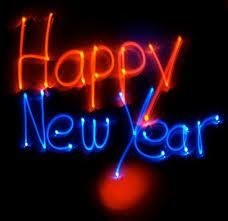 We’re entering the final days of 2014 – how did you do on your New Year’s eve resolutions these past 11.75 months? Is there any leftover item to be carried over to 2015? Happy Vishu. Here is an image of our Vishukanni this morning. 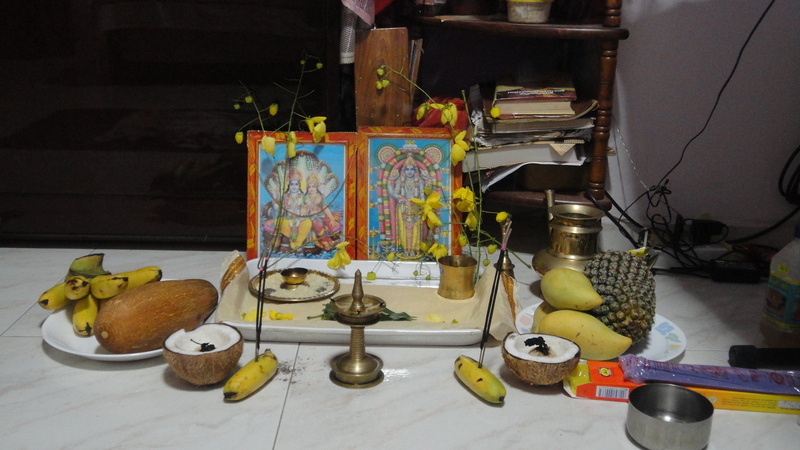 Vishu is a new year festival celebrated in Kerala. “Vishu” in Sanskrit means “equal”. Therefore Vishu is more probably denoting one of the equinox days. The most important event in Vishu is the Vishukkani, which literally ” the first thing to be seen on the Vishu day post waking up”. The Vishukkani consist of a ritual arrangement of auspicious articles like raw rice, fresh lemon, golden cucumber, betel leaves, arecanut, metal mirror, the yellow flowers konna, and a holy text and coins, in a bell metal vessel called uruli in the puja room of the House. A lighted bell metal lamp called nilavilakku is also placed alongside. This arrangement is completed the previous night. On the day of Vishu, the custom is to wake up at dawn and go to the puja room room with the eyes closed so that the Vishukkani is the first sight of the new season. 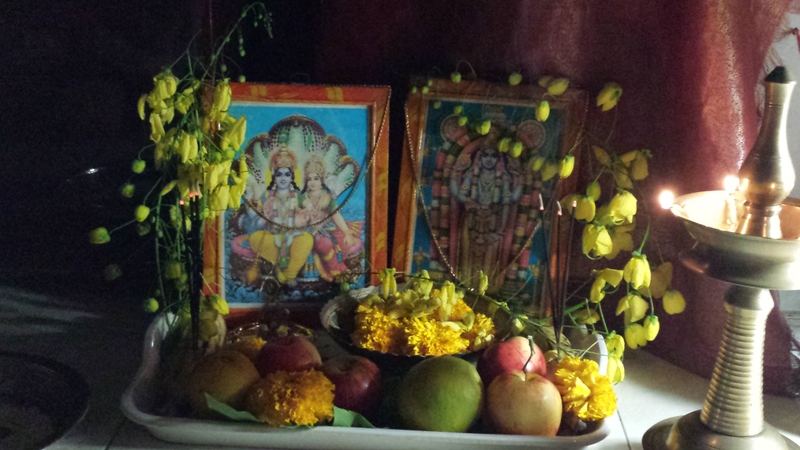 “Vishu” is celebrated with much fanfare and vigour in all parts of Kerala. Bursting crackers is part and parcel of the celebration especially for children. People wear new clothes (Puthukodi) for the occasion and elders of the family distribute tokens of money, called Vishukkaineetam, to children, servants and tenants. Vishu is also a day of feasting, wherein the edibles consist of roughly equal proportions of salty, sweet, sour and bitter items.